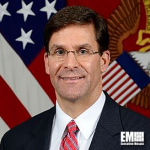 Mark Esper, formerly Raytheon vice president for government relations, has officially been sworn in as the 23rd secretary of the U.S. Army. He said in a letter addressed to the Army community that his top priorities as the service branch’s top civilian official are readiness, modernization and reform, the Association of the United States Army said Tuesday. “To be successful, we must work together and empower people at all levels to lead, innovate and make smart decisions,” he said in the letter. The Senate voted 89-6 to approve Esper for the position on Nov. 15, four months after his nomination by President Donald Trump. Esper’s previous federal experience includes work in the Defense Department as deputy assistant secretary of defense for negotiations policy. He also served in the Army’s 101st Airborne Division, the Army Reserve and the Virginia and District of Columbia National Guard.